February 14th is the one day when men are expected to be in charge of romance, but they tend to forget to make restaurant reservations, think the convenience store plastic rose is a sufficient present, or overlook the holiday entirely: 20% of men don't know the exact date of Valentine's Day, according to YourTango.com. 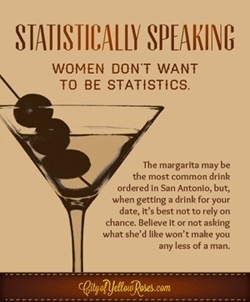 Now, San Antonio Tourism and Proof, its agency of record, have launched "The Gentleman's Guide To Valentine's Day" to provide tongue-in-cheek assistance to help men make this holiday memorable, or at least not screw it up. "Valentine's Day is usually a woman's Hallmark greeting card holiday," says Craig Mikes, Creative Director, Proof. "We wanted to flip that notion, but we aren't just preaching to guys and telling them what to do. We challenge them with tests and question their skills to get them to strut their stuff." At the same time, the campaign is designed to encourage couples to spend Valentine's Day in San Antonio. The CityOfYellowRoses.com website features links to more than 60 deals and promotions from local restaurants, hotels, and attractions. "San Antonio is well-known as a romantic place," says Cassandra Matej, Executive Director, San Antonio Convention and Visitors Bureau. "Valentine's Day is the perfect time to remind people that our city is the ideal place for romance." The campaign runs both nationally and locally, including in Texas Monthly magazine, on mobile sites CBS Sports and The Drudge Report, and via online display ads on Expedia.com and TripAdvisor.com. "Touch states" - that enable visitors to drive to San Antonio - receive additional attention, as well as cities that fly directly to the San Antonio airport. In Texas, local TV anchors are promoting the effort and a special themed float featuring yellow roses appears in San Antonio and Fort Worth rodeo parades. This is the second year of the Gentleman's Guide Valentine's Day campaign. Last year, the effort was credited with a 5% increase in hotel occupancy, 55,000 visitors viewed blog postings for its various partner offerings, and it generated $2 million worth of media impressions. That said, one change year-over-year came after executives learned that men like to procrastinate. "We launched too soon last year," says Proof's Mikes. "Guys just put it off and we saw a spike in traffic at the last minute. We aren't going to change men on that part, but at least we can help them make the right last-minute decisions." There are already plans for next year's campaign, which will likely expand the Gentleman's Guide beyond Valentine's Day. "We want to keep San Antonio on the top of the mind for any travel or romantic getaway," says Matej.